Home > McKee's RV One-Step Compound, Polish & Wax 128 oz. A true compound, polish and wax in one! McKee’s RV One-Step Compound, Polish & Wax is the perfect one-step solution for removing moderate to heavy oxidation to restore the gloss and color of your RV. A blend of real carnauba wax and synthetic polymers provide long lasting protection against UV rays and airborne pollutants. This zero-dusting formula is incredibly easy to apply by hand or machine. One-Step Compound, Polish & Wax can be used to restore the gloss and color on gel coat, fiberglass, and painted surfaces. 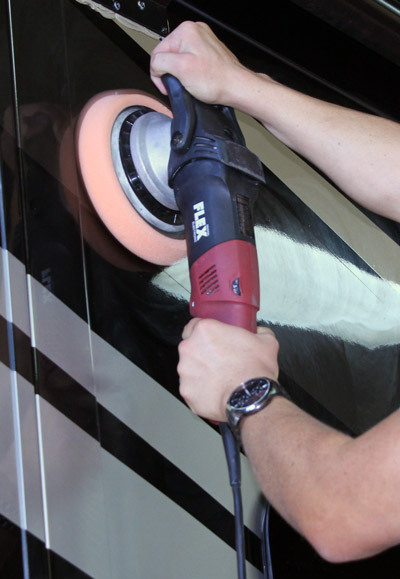 Not everyone has the time or the desire to perform a traditional 3-step compound, polish, and wax to restore the gloss and color of their RV. Advancements in surface care enhancement technology have made 3-step processes like the one described above unnecessary in many cases. McKee’s RV One-Step Compound, Polish & Wax replaces the need for a separate compound, polish, and wax. It does it all saving you time and money! Forget everything you know about other so-called one-step polishes and compounds because McKee’s RV One-Step Compound, Polish & Wax is a game changer. Formulated using an advanced blend of diminishing abrasives, chemical cleaners and a durable synthetic wax, McKee’s RV One-Step Compound, Polish & Wax is a time-saving solution to a task that used to take multiple steps over the course of several days. The secret to the immense cutting and finishing abilities of One-Step Compound, Polish & Wax lies in its abrasive technology. Featuring diminishing abrasive technology, the abrasives found in One-Step Compound, Polish & Wax start out large and progressively get smaller as you polish the surface. Simply put, this amazing one-step polish cuts like a compound and finishes like a polish, providing the best of both worlds. Its built-in synthetic wax provides protection that lasts the long haul. McKee’s RV One-Step Compound, Polish & Wax coats your RV with a durable shell of synthetic wax that provides months of protection against the elements of nature. Bug splatter, black streaks, road film, dirt, and oil will wash off with ease. The only thing that sticks is the shine! 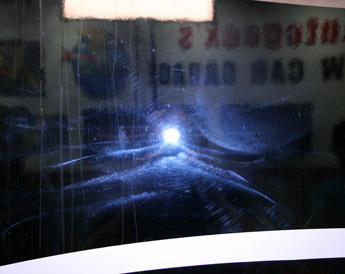 Before: This RV's finish is filled with swirl marks and holograms. Finishes like this are eall too common, even on brand new RVs. 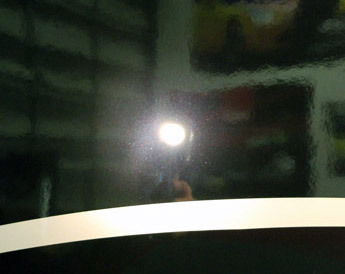 After: In ONE STEP McKee's RV removed the swirl marks, polished to a high gloss finish, and sealed for long lasting protection.